In the twentieth century, rural women faced a different—and arguably more rigorous—set of gender expectations than did their urban sisters. They did, of course, preserve and cook food, mend and wash clothes, care for children, and clean their homes, but they were also intimately involved in farm labor. Rural women raised produce, chickens, and pigs; kept the farms’ books; and worked in the fields. Their work was so essential that historian Richard Roeder called Montana women the “economic linchpins” of the state’s farms and ranches. Even more amazing than the number of tasks rural women performed is the fact that, before World War II, they largely completed their work without electricity. Anna Dahl, a farm wife from Sheridan County, helped change this. A key community activist promoting rural electrification in eastern Montana, Dahl helped bring power to six hundred families in Sheridan, Roosevelt, and Daniels counties. Her efforts significantly altered life on the farm, especially for Montana women. Anna Boe Dahl (1892-1986) arrived in Plentywood, Montana, with her brother in 1917. She taught school in Dagmar for two years before marrying Andrew Dahl in 1919 and moving to a 640-acre farm near Coalridge. There she and Andrew raised five children. During the Depression, Anna also taught English and farm economics for the Works Project Administration to supplement the family income. It is a myth that ruggedly independent, self-sufficient individualists populated the West. Like many of their neighbors, the Dahls worked cooperatively to improve their lives and their communities. Active in the Farmers Union of Montana, they participated in a variety of collective endeavors ranging from digging wells to cooperative coal mining. After the dry years of the Depression had ended, the Dahls used their knowledge of community organizing to build grassroots support for rural electrification. Federal assistance made rural electrification possible. In 1936, the U.S. Congress passed a bill to create the Rural Electrification Administration (REA), an agency that offered liberal federal loans for rural electrification and gave preference to state and local governments, cooperatives, and nonprofits over private utilities. Local efforts were also essential. 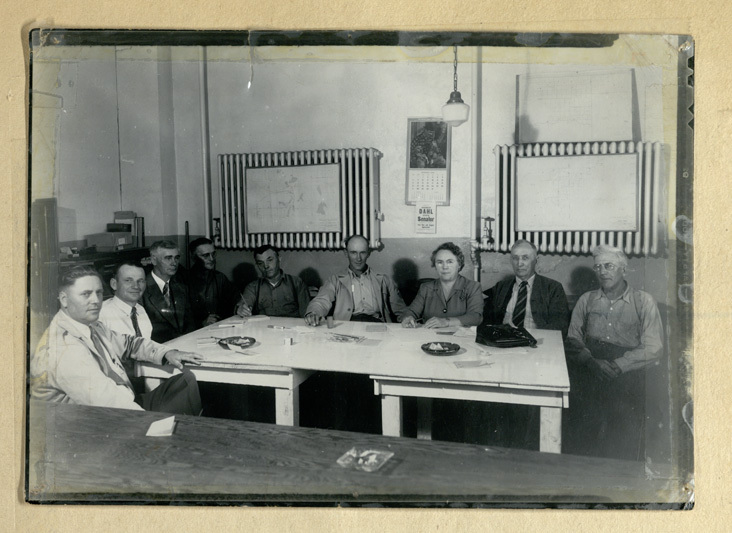 In August 1941 Anna Dahl and her neighbors formed the Sheridan County Electric Cooperative, to which she was elected secretary. The co-op received an REA loan in 1945 and the power came on in 1948. Writer David Long attributes the cooperative’s success to Dahl, describing her as the “nuts and bolts of the Sheridan project, its unfailing center of energy for years.” In 1956 she became the president of the co-op, only the second woman in the United States to serve in that function. Anna Dahl’s background as an educator was particularly useful as she worked to build local support for electrification. She spoke passionately about the benefits of electricity to farm families as she persuaded her neighbors to support the co-op. Electricity did transform rural women’s work dramatically. Access to hot running water and the ability to use such technologies as electric stoves, washing machines, and vacuum cleaners reduced the “muscle power” housekeeping required. However, these “labor-saving” technologies did not necessarily save women time. Paradoxically, electrification may have actually increased women’s workload because standards for cleanliness became more rigorous. Historian Robert Kline finds that in the 1950s and 1960s, home economists promoted technology to farm women not as a way to create more leisure time, but rather “as a means to increase the quality and productivity of ‘home-making’.” Once women could wash clothes more easily, they were expected to wash them more often. And the free time women earned using a vacuum was now supposed to be spent on child care or home management. Want to learn more? Read David Long’s article, “‘We’re Not Isolated Now!’ Anna Boe Dahl and the REA,” in Montana The Magazine of Western History 39, no. 2 (Spring 1989): 18-23. You can find links to the full text of all Montana The Magazine of Western History articles relating to women’s history here. Anna Boe Dahl Scrapbook, 1940–1986, SC 909, Montana Historical Society Research Center, Helena. Carmody, John M. “Rural Electrification of the United States.” Annals of the American Academy of Political and Social Science 201 (January 1939): 82-88. Holmes, Krys. Montana: Stories of the Land. Helena: Montana Historical Society Press, 2007. Kline, Ronald. “Ideology and Social Surveys: Reinterpreting the Effects of ‘Laborsaving’ Technology on American Farm Women.” Technology and Culture 38, no. 2 (April 1997): 355-85. Long, David. “‘We’re Not Isolated Now!’ Anna Boe Dahl and the REA.” Montana The Magazine of Western History 39, no. 2 (Spring 1989): 18-23. Mercier, Laurie. “Women’s Role in Montana Agriculture: ‘You Had to Make Every Minute Count’,” Montana The Magazine of Western History 38, no. 4 (Autumn 1988): 50-61. Thank you so much for your article on this very special person. Strong, strong lady. She is a legend in her own family, so admired and revered, anecdotes oft repeated which we never tire of. But my personal memories as one of Anna’s “littler” grandchildren were of the kindly elderly lady with the low voice, calling me by my pet name, and always feeding me bacon, strawberries, and cream. I had my first homemade lemonade by Grandma’s hands. She was an artist, as well – I have reproductions of some of her water colors, sent to me by another Dahl grandchild. They are gorgeous, evoking mood and drawing one in.